The dollar yen continues to struggle higher but without any great conviction at present with yesterday’s down candle symptomatic of this lack of momentum at present. However, the low of yesterday did find some support from the 9 day moving average and this pattern appears to be continuing in early trading today with the pair failing to sell off sharply as a result. 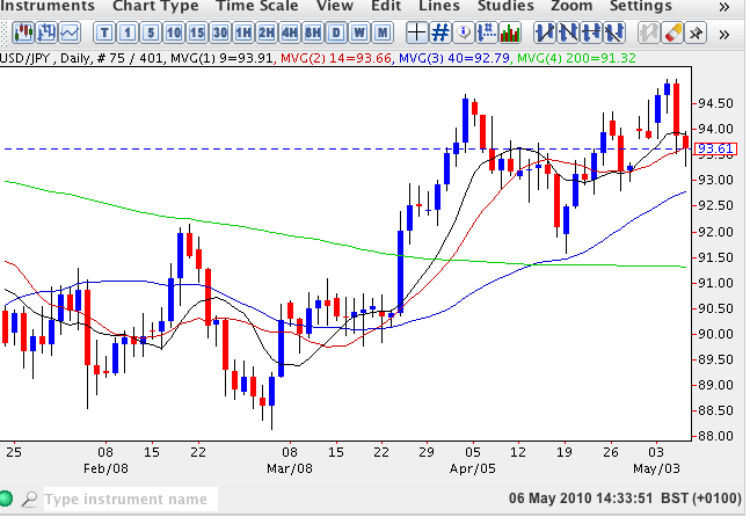 The 40 day moving average is perhaps the key technical indicator for the yen to dollar pair at present having provided a solid barrier to any short term pullback over the last few weeks and this is currently residing in the 93 price area which should provide a cushion in the event of a further fall. Longer term the outlook remains mildly bearish with the weekly chart reinforcing this view, particularly given the level of support from the 9 week moving average. However, we are now running into serious price congestion between 95 and 100 and only some sustained momentum will drive the pair higher and through this congested region. Should we achieve 100 and above in due course then the ensuing rally could develop into a longer term trend, particularly if we clear the 200 week moving average which is currently sitting at 104. The price action this morning suggests that bullish sentiment remains in place at present with a relatively deep test in early trading. You can catch up with the fundamental news for the US at my weekly newsletter while Japan is still closed for the Golden Week celebrations.